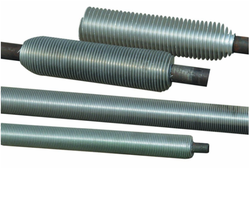 Prominent & Leading Manufacturer from Chennai, we offer aluminium extruded finned tube, aluminium extruded finned tubes, aluminum fin tubes and bimetallic fin tubes. We are a Leading Manufacturers, Suppliers & Exporters of Extruded Finned tubes and our tube quality was approved by domestic and international clients. We are exporting our finned tubes to Thailand, Malaysia and Dubai. Aluminum extruded fin tubes is formed from a bi-metallic tube. Consisting of an aluminum outer core and an parent tube of almost any material. The fin is formed by rolling material from the outside of the exterior tube to give an integral fin. The extruded fin is manufactured by compressing an aluminum outer core tube onto the parent tube. The outer core tube is exposed to extremely high pressures which essentially "grows" the fins into the final fin profile.Maximum operating temperature for this fin type is 290°c. Base tube of extruded finned tubes can be ss, cs, corrosion resistance steel, copper, copper alloys. We provides more than 10 types of common sizes from 15 mm to 64 mm outer dia of bimetal extruded fin tubes with 5 to 9 fpi, many special sizes in single-metal & bimetal extruded fin tubes are also available. 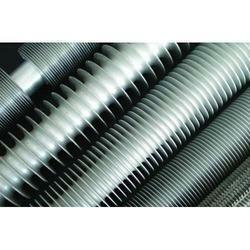 We have a complete devout in offering highly demanded Aluminium Extruded Finned Tubes. The offered range is trusted widely for its integral formation which is best suited to reduce the operating cost and size of heat exchangers. Precisely manufactured with aluminum outer core and a parent core, these tubes are an outcome of the most advanced techniques where the extrusion is crushed on the lining and resulted in industry compliant range of spiral shaped finned tubes. Further, we are providing the quality product in varied sizes at the best price. 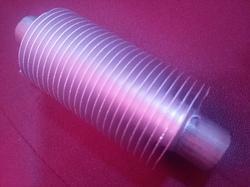 We are well known entity involved in offering supreme quality Aluminium Extruded Finned Tubes. These tubes are widely demanded for the offered space, weight and structural savings in varied heat exchanger equipments. Consisting of an aluminum outer core and a parent tube these tubes are helically wound and manufactured by rotary extrusion process to provide superior mechanical strength. Further, our prestigious clients can avail the industry compliant range from us in varied sizes and shapes at a leading price. 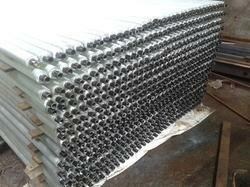 We are the leading manufacturer and exporter of Aluminium Extruded Finned Tubes made from supreme quality material. 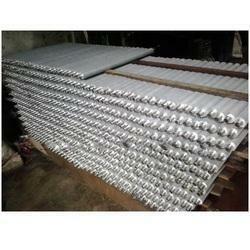 We are the leading manufacturers of ALUMINIUM FIN TUBE in various sizes which is used in Heat exchangers. Primarily used in corrosive atmosphere and high temperature conditions, the extruded fin is manufactured by compressing an aluminum sleeve onto a parent tube. High compression reforms the aluminum into the final fin profile. High mechanical strength of fins. With the aim of attaining pinnacle success in the market, we are engaged in offering premium grade Aluminum Fin Tubes. 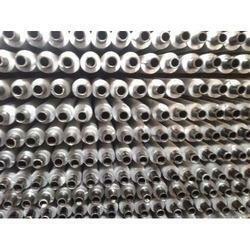 The offered tubes are widely installed in heat exchanger systems in rice mills, sugar mills and textile industries. Demanded widely for its light weight design these tubes feature remarkable mechanical properties. Owing to our well integrated setup we are developing robust range of fin tubes in extruded and crimped designs that can be ordered from us at a leading price. We are the leading manufacturer and exporter of Bimetallic Fin Tubes made from supreme quality material.